It’s time to start something new! What’s your New Years Resolution or endeavor for 2019? Preface: This article is an allegory—it is an exploration of logic and rationality beyond the common tech blog rhetoric. I work for Apple and as a rule I’m not supposed to review nor represent Apple outside of my job. This is not endorsed by Apple and may or may not be completely aligned with Apple marketing. In 2010, Steve Jobs announced iPad. It was a beginning of a new age of device for Apple and, while tablet computing was not new, a new era of tablet computers. While many ridiculed, and still do, Apple for making a “giant iPod Touch”, I in fact wrote a review and made a bold statement that these people just did not have the vision to understand the potential of iPad. I said the same thing about Apple Watch and iPhone. Here we are approaching nine years after the launch of iPad and it has evolved a substantial amount. It also still receives the same ridicule as in 2010 despite being deployed by hundreds of companies, used by students, replacing desktop and laptop computers, and more. 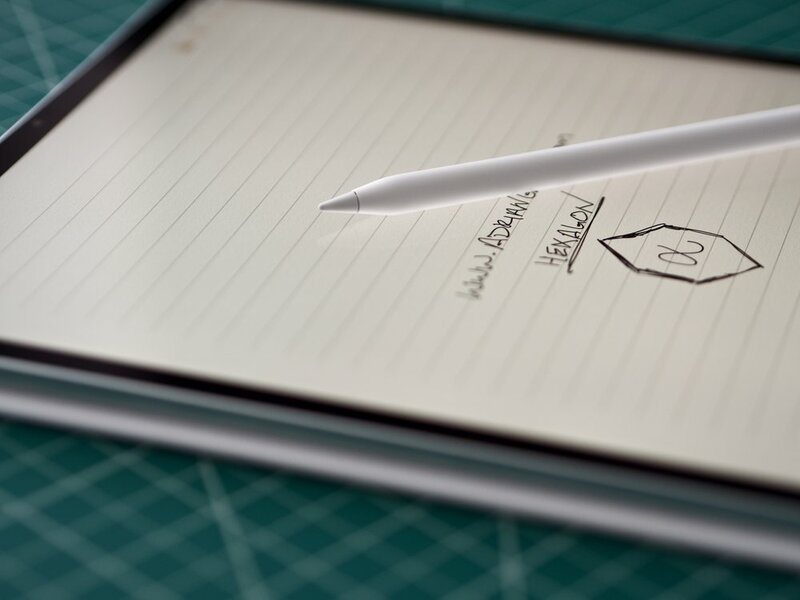 iPad Pro and Apple Pencil took everything even further to make it a writing and design device that goes unrivaled. The common argument against iPad is that is can not replace a computer. This is a strange argument because it inherently has replaced “traditional” computers for many people. On a day to day basis, I use my iPad Pro for my computing needs. In fact, I’m writing this article in Evernote and will post it to here through Squarespace Blog app all from my iPad Pro. Let’s be clear about the illogical nature of this anti-iPad theme and what it is all about: what is the definition of a computer? Simple—anything that computes is a computer. Though that may be a valid statement, I think I would have a hard time with that extremely general definition. A microwave computes but it isn’t what people consider a computer. I think it best to state that general computing would be devices that send e-mail, connect to the internet, edit photos or video, allow the installation of applications, play games, have productivity tools like Pages or Microsoft Word, etc. iPad can do all of those things. It would appear that it is a computer. However, the counter argument is that it doesn’t have pro apps on it. Well, that isn’t true. Procreate, for example, is a very powerful design and drawing app. Pros are using it to design work that they get paid for. It is a premier app for iOS. Affinity Photo and Pixelmator are very powerful image editing applications. Affinity Designer, a vector design app, sister to Affinity Photo, is most definitely a pro app. More importantly, there are apps that you and I don’t use because they aren’t available to us. GE uses iPads to support their engineers on the floor while designing jet engines. United Airlines uses iPads for their pilots. And walk into an Apple Store and you’ll see employees literally running the daily operations of the store from iPad devices. Clearly it is a professional device and always growing. In fact, at the announcement of the new iPad Pro, Adobe announced that Photoshop will be coming to iOS next year. They showcased a 3GB .PSD file with 157 layers and editing it in real-time on stage. I’m not sure what else would convince someone of the power behind iPad. However, now we get to some other concerns. Is iPad the right computer for you? This is where it gets fun. It seems that tech bloggers are under the impression that because it may not be the right device for their computing needs that it therefore isn’t a computer for the 7.5 billion other people on the planet. Wow... what hubris. Not too long ago, most transportation needs for people in the United States were met with a horse and carriage/buggy. Then one day the automobile was invented and slowly but surely the horse and buggy became less and less common in favor or a newer and effective way of tansportation. However, not long after the automobile, the Model T Ford, came about, some people noted that this vehicle didn’t meet their needs. Some people needed to haul things like bricks, dirt, animals, and such. And people needed to plow fields and move earth and tow boats and even move other automobiles. From this need came pickup trucks, semi tractor trailers, bulldozers, threshers, and more. It seems that not one automobile could solve or resolve all the needs of everyone, everywhere. We humans came up with new things to fit those needs. Fast forward a few decades and we enter the era of personal computing. Interestingly enough, the narrative of the automobile is very much the same as the narrative of the personal computer. The PC/Mac began as a big, sometimes ugly, box of a desktop. By today’s standards it was nothing but a giant pocket calculator but it started everything. Like the automobile, people soon found that this desktop didn’t fit all their needs. Some people wanted something portable that they could take with them. Enter the very first laptops—though they weren’t very lap friendly. But that size was quickly reduced. The needs of people are all different. Sometimes, for example, I have to use my MacBook Pro for video editing in Final Cut Pro X. Does my iPad Pro replace my MacBook Pro in that instance? No. However, when I’m writing or designing with my iPad Pro and Apple Pencil, my MacBook Pro doesn’t replace my iPad Pro. There is an old saying: use the right tool for the right job. I think this is very important for people to consider when looking at any technology. I’m fairly certain that all of this makes a solid argument for iPad being a computer. It isn’t a PC, per se, but it is definitely a computer. These arguments against iPad devices not being computers are based on a misunderstanding of what iPad devices are, unrealistic expectations, or even defying the very nature of what mobile computing is. On many occasions I read people comparing iPad Pro to the Microsoft Surface. To be clear, the Surface runs Windows—a desktop operating system. They love all the ports, the “full” desktop OS, the trackpad, keyboard, mouse connectivity, etc. These reviews always seem strange to me because what they are loving is a laptop; the Surface is a laptop. The Surface isn’t a very good tablet. With the keyboard attached and a trackpad/mouse, all Microsoft did was take all the ports that would have been found in the base of a laptop and move them to the screen. Instead of the screen folding up, the keyboard folds down. In fact, the device is designed to be used primarily in landscape mode: the kickstand inherently makes it a landscape device and with a 3:2 aspect ration screen, it isn’t very ergonomic for portrait use. (I know someone is reading this and touting that is just my opinion but a 4:3 screen is mathematically more appropriate both ergonomically and visually.) iPad, on the other hand, can be used effectively in any orientation. Microsoft’s own marketing photography shows the device only being used in a landscape configuration—even being held in landscape when in “tablet mode.” That is the least ergonomic method for using a tablet as the center of gravity is further from one’s hand. Incidentally, the Microsoft Surface 6 is nearly twenty percent heavier than the current 12.9” iPad Pro (2018) thus even more combersome. Some argue that they will never use an iPad until it supports a pointing device like a mouse or trackpad. That is completely contrary to what the device is. One, iPad takes advantage of the best pointing device a human can use: one’s finger. That is the touting feature of touchscreen devices that an entire obstruction between the user and the interface has been removed. An additional pointing device would only complicate matters. And, for the record, Apple Pencil is an input device and can be used as a stylus but it inherently is not a stylus. iPad does not need more input device functionality. It is contrary to its very nature. Trying to make a non-laptop device into a laptop isn’t a productive endeavor. If one wants a laptop, then one should get a laptop. Adrian’s Life Rule #62: Things can only be what they are, not what one wants them to be. Another common criticizism is the “lack” of ports. This is again contrary to its nature. Mobile phones, tablets, and other mobile devices are inherently designed to be wireless. Mobile phones, especially, are by very definition wireless devices. The whole idea behind iPad, iPhone, and devices measured in the same categories are that they don’t get things plugged into them. That isn’t to say sometimes you must plug something in to charge the device, download photos from a memory card, etc. but overall, these devices are wireless. They print wirelessly, so why plug in a printer? They use cloud storage, so why plug in a hard drive? Actually, to be fair, with the ability to connect external monitors to iPad Pro, making more a “traditional” computer than ever, lends itself the need for external storage. It would be valuable for photographers, music producers, video editors, etc. but consider having one’s iPad with three or four things connected—that wonderful .45Kg light, 5.9mm thin, mobile computer is now chained to a desk. I suppose perhaps the option would be nice but to make the point again, it sounds like a laptop is more what one needs—even a desktop. In the end, the story I like to tell the most about iPad being a computer is a true story of my mother. Some years ago she had knee surgery. Her iMac was on the second floor of the house and for weeks there was no possibility of her climbing those stairs. We decided to get my mother an iPad so she could do the things she needed like email, photos, Facebook, play some games, watch movies, and much more. Since the day she got an iPad, she has never gone back to using a “traditional” desktop or laptop. She loves her iPad. She had the first generation of iPad, the third, and currently an iPad Air 2. You couldn’t pay her to ditch her iPad for some other computing device. While not everyone is my mother, if iPad can be her computer, is it possible it could be yours too? When one lets go of this false dilemma that a computer must be either a laptop or a desktop, one can easily see how iPad Pro is a computer. There is something special about using Apple Pencil 2 on the new iPad Pro. 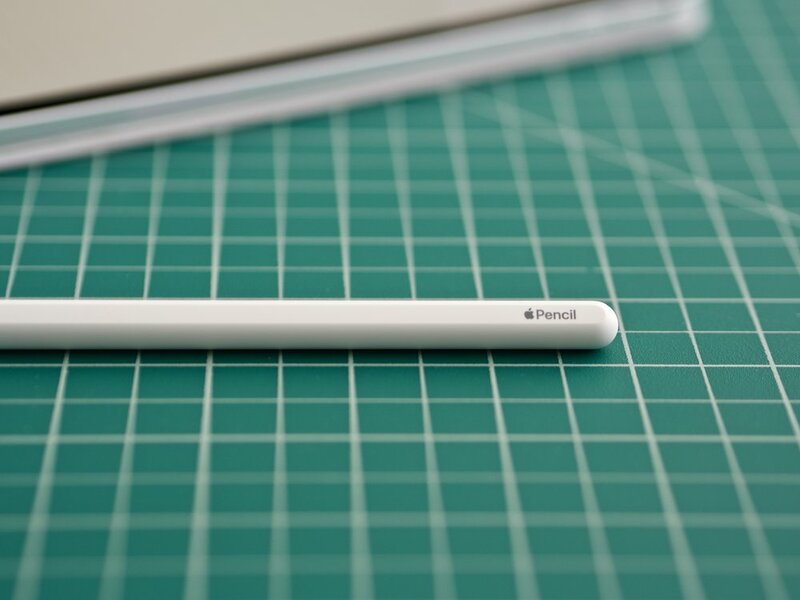 Apple Pencil 2 is the first piece of technology in my 15 years in the tech industry to impress me in such a way that I can not completely articulate my point. Not hours ago, I was discussing this very observation with a colleague and friend who just got her iPad Pro and Apple Pencil 2. We both we inclined to say that it writes/draws significantly better than the original Apple Pencil. Perhaps it is the imperceptible lag from tip to writing? The twenty milliseconds of lag while using the first generation is apparently imperceptible but maybe on a subconscious level the human mind still intuitively notes that lag and a sliver of analogy doubt, however paper thin that doubt is, nags at one’s perception. Apple did not mention anything about the lag time of Apple Pencil 2—Apple is always one to boast about significant improvements. If, for example, the lag is ten milliseconds, Apple could easily have said, ‘Lag time has been cut in half.” Marketing folks hearts flutter when they have such specifications to exclaim to the world. But we in fact didn’t hear anything about it. It may be that the screen interface of iPad Pro is simply more accurate when in concert with Apple Pencil 2 so the “ink” is right under the tip. But I have nothing to substantiate that supposition. In the end, no matter what is the behind this perception, it makes no difference as Apple Pencil 2 and writing on iPad Pro is a wonderful experience. *This article and the viewpoints discussed are not representative of Apple. My opinions and observations are my own and not to be confused with Apple’s marketing or perspective. Some of the best apps are apps that make every day things a little simpler. One of my favorite apps to help with little tasks is Deliveries. It does one thing and does it really well. It tracks packages. From FedEx to USPS, Royal Mail and DHL, grab a tracking number and one will receive notifications on Apple Watch, iPhone, iPad, and Mac. Deliveries shows locations, delivery estimates, days to arrival and more. Add a name to the delivery should there be more than one coming from the same courier. Made by JuneCloud, they are a small developer out fo Detroit making only a few apps but all really well designed. Not only do they help one track their packages, they also make a simple and classy notes app called Notefile. Today Deliveries users received an update making this app even more useful: Siri Shortcuts. Simply say to Siri, “Show me my deliveries,” and a quick view of what deliveries are available show up. Some other nifty features of Deliveries are the ability for it to add the estimated delivery date to one’s calendar. It will show up as an all day even so even when one’s eyes aren’t on the app or Notification Center, Calendar will still keep one updated. Deliveries is available on all iOS, macOS, and watchOS devices, tracking a package can be done from desktop to pocket to wrist and it syncs via iCloud. 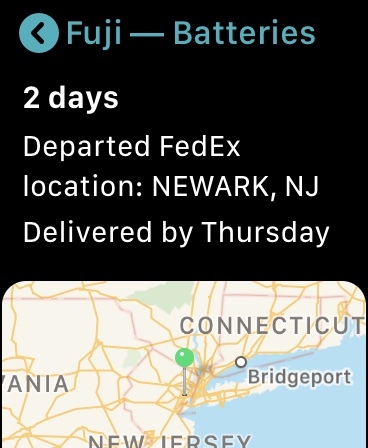 It is one of my favorite things to see the Deliveries complication on my Apple Watch watchface with the days until a delivery—with a single tap, I get all the same information as on iPhone or iPad. Additionally. If more information is needed, Deliveries is pulling data from the couriers’ website and one can quickly jump to the detailed information. It is a five dollar app but totally worth it. The new Siri features really make it a quick and easy app to work with and the interface remains one of my favorite. Tip: If one copies a tracking number from an e-mail or website, upon opening Deliveries on iOS, a “quick entry” notification pops up for speedy input. I run several camera systems at the same time... crazy I know. Most systems are very similar and very capable. My Nikon system is really my high end professional gear—big, powerful, strong ecosystem. My Olympus gear (Micro Four Thirds) is small, great for travel, some wonderful lenses, and impressive innovation. 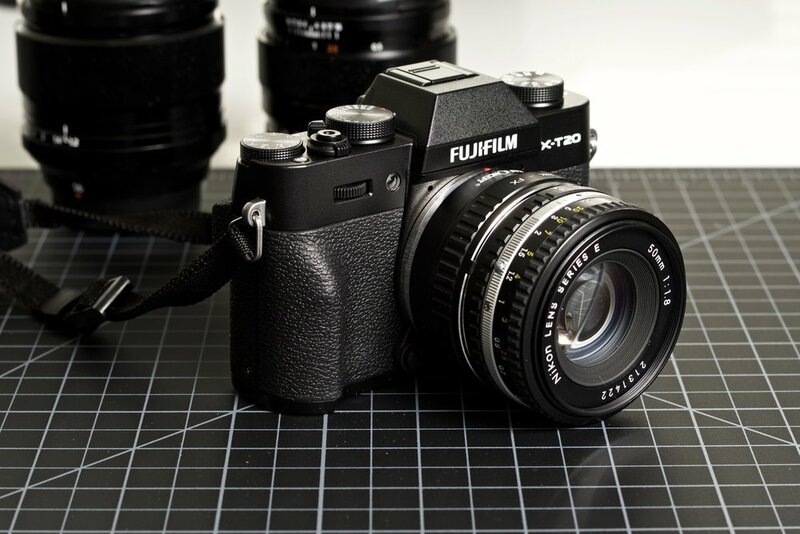 Finally, I also have a FujiFilm X-T20 and a clue of lenses—Fuji is making some of the best camera and lenses around these days and also the only affordable medium format cameras on the planet. I can get into more details about why these systems are all in my camera bag but one of the reasons I have my Fuji system is for using adapted lenses. There is a common fallacy that “old lenses” are not functional for digital cameras. It is an unexpected and untrue statement but I assume it is for two reasons: camera companies want you to buy the newest gear and a lot of people believe that old is bad and new is better. I can’t speak for the camera companies but they are in the business of selling equipment so it seems likely they wouldn’t dissuade someone from believing that their old film lenses from the 1960’s aren’t good. Fact is, normal and telephoto lens optics haven’t really change much. Mostly is is some technology like image stabilization and various lens coatings. Wide-angle lenses have come a long way—Nikon is probably the front running in this area but in past, wide-angle lenses weren’t so hot. Otherwise, lenses from decades ago frequently have some very wonderful and unique qualities that aren’t found in many lenses today because, you know, sharpness is everything according to so many photographers. I’ve been fortunate to find and play with some absolutely incredible old lenses from long before I was even born but the problem is, these lenses have mounts that are all but extinct. Or, like my Nikon 50mm ƒ1.8 E-series, does use Nikon’s F-mount and still work on my Nikon cameras but it is also a great lens to mount on my Olympus or Fuji cameras—it is worth using on any camera. Lens adapters can be very expensive—$99+ in many cases. However, I was searching around on eBay for a few deals on said adapter when I stumbled on K&F Concepts. These adapters are usually around $25 and are really well made. All metal construction, these adapters come is a protective case, and K&F have adapters for just about every mount imaginable. From Nikon F to Fuji X mount to Exakta to Micro Four Thirds, all of my fun “vintage lense” have new life on my cameras. It is important to note that adapted lenses do not communicate with the camera; one will not have any meta data such as aperture, focal length, and the like. Some lenses, Nikon G-type for example, do not have aperture ring and therefore specific adapters with an aperture ring are needed. Notice the different between the general Nikon F adapter and the Nikon G adapter. 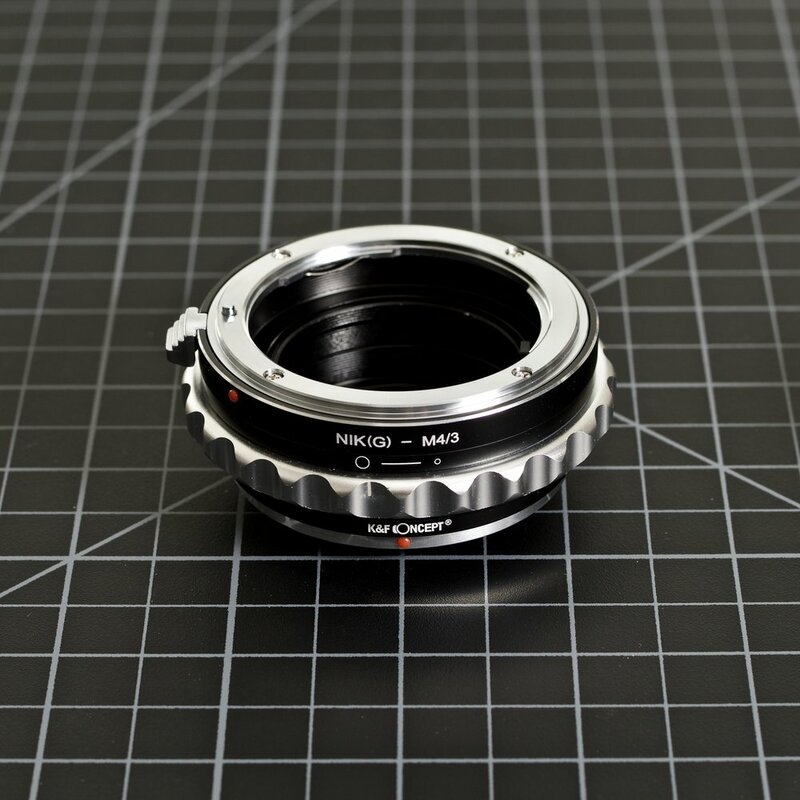 The scalloped metal ring controls the aperture lever for G-type Nikkor lenses. 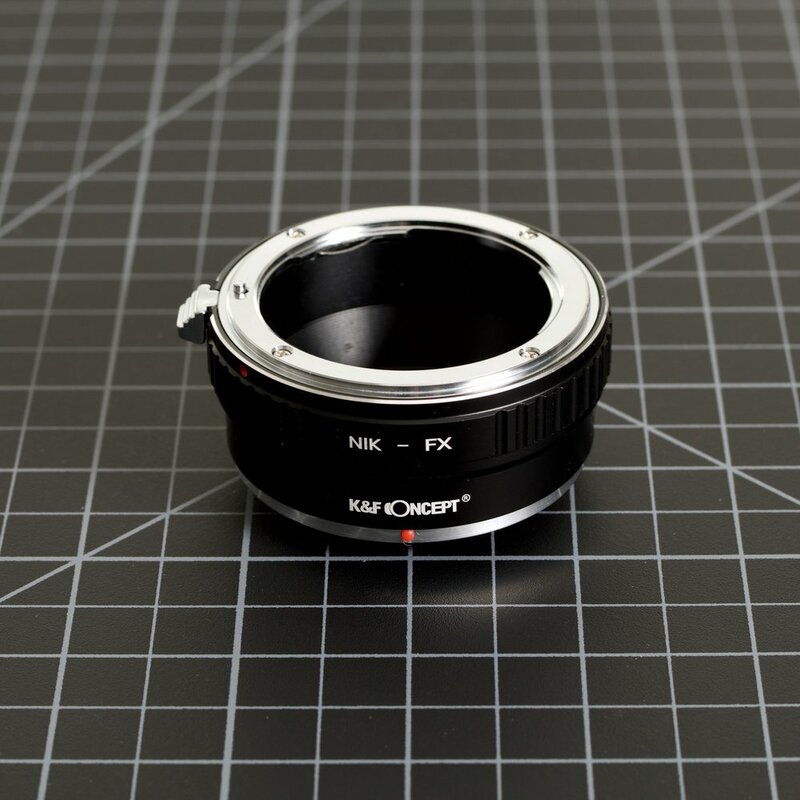 It is important to also note, the aperture ring does not have actually click stops to certify what aperture one is using but there is some feedback from the ring (clicks) to know it is functioning. Using these adapters ensures one will get comfortable with both manual focus and manual controls as a whole. Sadly, as it stands, the E-type (not E-series) Nikkor lenses are not supported at all because only a Nikon camera can control the electronic [E] aperture. The good news, those are very new lenses. Nikon only makes a few. But since these adapters are really about working with older, vintage, or specialty lenses, it should not pose a problem. I can’t recommend these more. For $25ish, one can get a bunch of these for the price of one Metabones adapter. They are low enough cost to allow one to collect all sorts of old lenses and enjoy the artistic elements of lense that are essentially extinct. An old photography adage: You date the camera but marry the lens. Keep those old lenses around and put them to good use with these simple and great adapters.